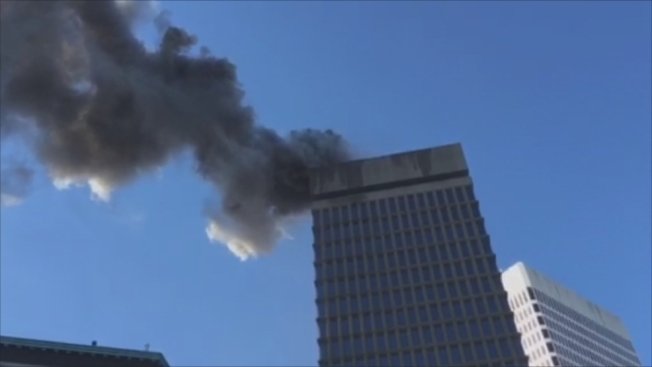 A fire atop one of downtown Providence's tallest buildings has sent thick black smoke into the city sky. The Providence Journal reports scores of firefighters descended on Textron Tower around 10:35 a.m. Sunday responding to a rooftop fire. It took about an hour to get the fire under control. Fire officials told the newspaper the blaze was confined to a rooftop heating and ventilation system and did not burn the 25-story building, which is the headquarters of Textron, a Fortune 500 company that owns Bell Helicopter. Public Safety Commissioner Steven Pare said investigators were looking at whether water from the firefighter' hoses damaged the floors below. The smoke plume could be seen from as far as Route 195 in East Providence.